Mysterious domed craters and trenches on Mars point to electric discharge in recent geologic times. In our Picture of the Day for March 25, we compared photographs of small blue-gray spherules on Mars to the results of laboratory experiments by plasma physicist C J. Ransom. For his replication of these Martian “blueberries”, Ransom used a bed of hematite, a primary constituent of some Martian soils. By blasting the material with an electric arc, he produced an array of small blue-gray spherules and fused globules virtually identical in appearance to those seen on the surface of Mars. Experiments of this sort will prove invaluable to our understanding of planetary evolution and geology. An electric arc is a plasma event, and plasma events are scalable, which means that the same formations can occur at virtually every scale—from centimeters-long sparks in laboratories to light years-long “jets” in active galaxies. Elementary structures of plasma discharge, now well documented in the laboratory, appear in lightning strikes, in auroras, on the Sun, in nebulas, and in remote galaxies. The ease with which electric arcs create the Martian “blueberries” not only draws our attention to many apparent	analogs on Earth, but to other larger scale formations on Mars. In our Picture of the Day for March 29 we showed images of a couple dozen “domed” craters on Mars, which have puzzled planetary scientists for several years. The spherical domes rest within circular craters and look very much like the spherules in Ransom’s experiments, which also rested in craters with partially fused rims. 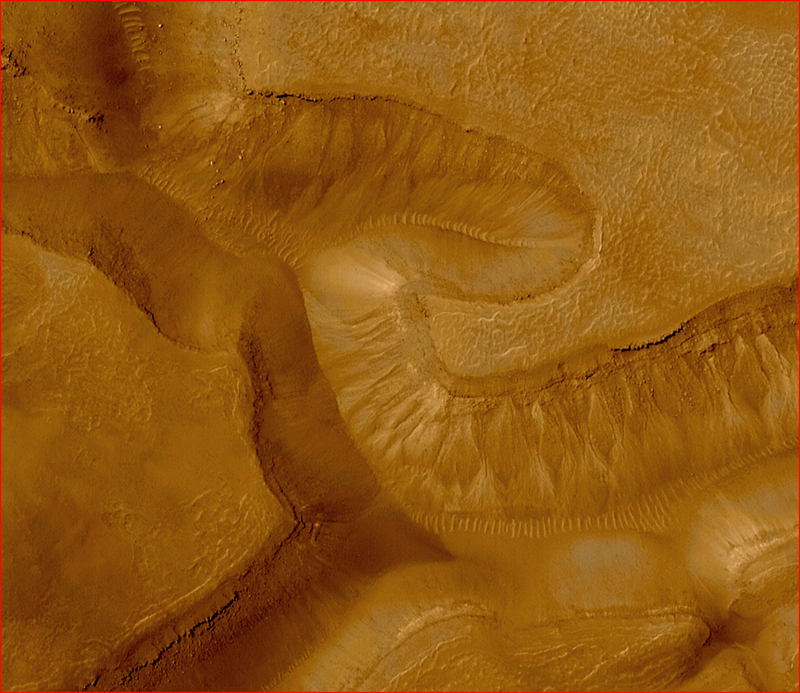 On Mars the anomalous formations lie in the Arrhenius Region, some 36,000 square kilometer of terrain in the southern hemisphere east of Hellas Planitia. (More precisely, the region is located between 235° and 240° east longitude and 40° to 45° south latitude.) Planetary scientists have expressed their wonderment over these improbable formations while offering equally improbable guesses to account for them. A recent article published by R. Foxx, et al., listed five proposals, two of which (cinder cones and table mountains) they sought to substantiate as alternative possibilities, depending on when the domes were created in relation to the surface material in which they lie. There is more to this region than the domed craters, as can be seen in the pictures above. (We’ve placed a more complete picture of the region here). The weirdly “wormlike” formations, exposed within craggy trenches, have provoked astonishment from scientists and a host of speculations about “artificial tubes” or “transportation systems” beneath the surface. But the speculations in the direction of artificiality or intelligent construction can be excluded through consideration of similarly grooved and ridged formations in other contexts such as the Gorgonum Region, just one of thousands of examples. Further examples will appear in coming Pictures of the Day. Here, in brief, is an electrical interpretation. An interdisciplinary investigation of data concerning Mars suggests that in the past the entire planet was subjected to interplanetary-scale plasma discharge events. Vast regions were excavated to depths measured in miles. Some of the material was accelerated electrically into space; some was emplaced back on the surface to form the ubiquitous but unexpected layering, whose origin is now debated by planetary scientists. Diffuse discharges baked the surfaces of implanted layers as in a plasma oven, giving rise to hardened strata exposed in the walls of canyons. 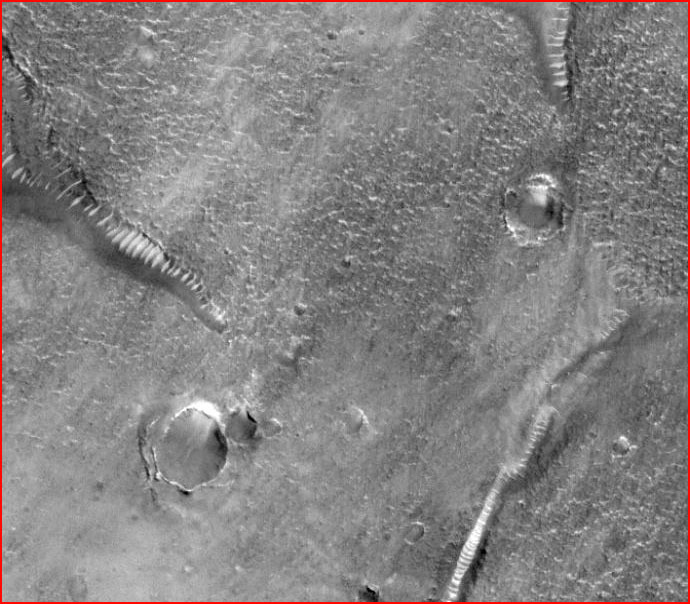 Arc discharges burnt and blasted craters into the surface. Lightning many times more energetic than that of thunderstorms we know today ripped across the Martian landscape. Many of the blast channels it left are mistaken for flood or lava erosion, a perception that can be easily corrected through attention to detail. But in the floors of many of these channels appear glassified ridges, or “fulgurites”, as in the Gorgonum Region noted above. On a smaller scale the lightning’s transverse coronal filaments, always perpendicular to the direction of the primary discharge, formed and fused the same characteristic ripples in the regolith of the Arrhenius Region. In some channels, multiple lightning strokes have cut terraces, each with its faint fulgurite ridges. The existence of these mysterious ridges is a crucial prediction of the Electric Universe. In the electric view, therefore, both the domed craters and the accompanying trenches of the Arrhenius Region are the result of cosmic lightning strikes. Where an electric arc “stuck” briefly for a while to a point on the surface before being extinguished, it produced domed craters, as in Dr. Ransom’s experiments. Dr. Ransom has informed us that in his experiments, if a lower energy arc was extinguished before a complete spherule was formed, the result was a dome. The fully rounded spherules were the result of higher-energy discharges. From the Electric universe viewpoint, the domed craters and the “wormy” channels simply reflect two common electrical discharge effects on a surface. We expect to find them in close association. And we can confidently predict that more extensive laboratory experimentation will confirm the association in every important detail.